The first stand-alone purpose-built theater since antiquity, the Teatro all’antica, still remains in the hamlet of Sabbioneta. It was designed by the Italian architect Scamozzi and commissioned by Duke Vespasiano 1 Gonzaga. The façade sports the inscription “Roma Quanta Fuit Ipse Ruina Docal.” The expression might elude you. "Plus ca change, plus c’est la meme chose” is probably more applicable. Even back in the 16thcentury people were using culture to create a kind of credibility. And plainly the Duke was looking to enhance the stature of his small duchy. Real estate developers know that when artists move into a backwater, home and apartment prices go up. Sabbioneta is still the sleepy little town that it probably once was back in 1588, though it still has a synagogue remaining from a time before the Second World War when there were thriving Jewish communities all over Italy. But what would the local fare have been? Perhaps commedia dell’arte, the masked comedy based on stock characters like Pulcinella, Pantalone and Arlecchino would have fit the bill. However, the Teatro all’antica was not like the Globe which would come into existence only a few years later. 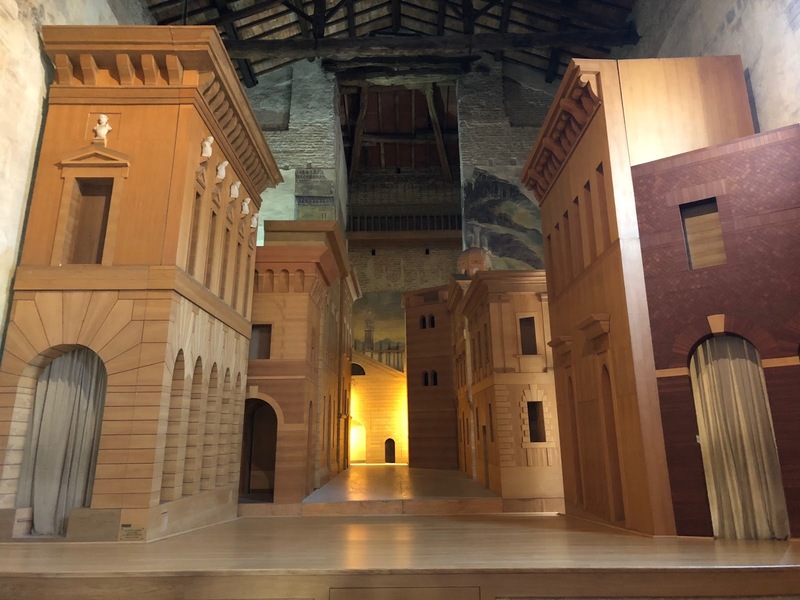 While the Elizabethan stage produced a kind of tabloid journalism written by a fellow named Shakespeare playing to the appetites of the masses, the Teatro all’Antica was a small theater with burnished wood benches which plainly catered to the elite.